Analysis performed on behalf of the Soy Transportation Coalition documents the strong relationship between our nation’s freight transportation system and individual farmer profitability. The study provides compelling evidence that farmers, more than any other segment of agriculture, are responsible for paying the transportation costs from the farm to the dinner plate. The study, performed by O’Neil Commodity Consulting, examined 36 soybean loading facilities across seven states (Illinois, Indiana, Iowa, Nebraska, North Dakota, Ohio, and South Dakota) and analyzed the relationship among origin basis, destination basis, and transportation costs. The resulting graphs from the analysis all exhibit how transportation costs are disproportionately absorbed by farmers via a declining origin basis. The report specifically identifies how in periods of strong worldwide demand (a “demand pull” market), the ultimate customer will pay the costs – including transportation costs – for obtaining the shipment of soybeans. 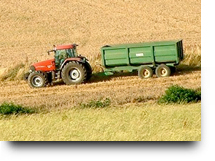 However, the report notes, “after the temporary demand pull is over, the market will always adjust/correct and any increases in transportation costs will always be passed back to producers.” Over the long term, as the report highlights, agriculture is a “supply push” market due to strong competition from other grain and oilseed producing nations – resulting in transportation costs being disproportionately passed back to producers. The graphs from the 36 soybean loading facilities provide examples of when the relationship between transportation and farmer income is strongest (“supply push” market) and when it is the weakest (“demand pull” market). For example, in the below graph from Jeffersonville, Ind., the correlation between transportation costs and origin basis (farmer income) is clearly evident. As transportation costs rise, origin basis diminishes. This is particularly the case from 2004 to 2008, a period largely categorized as a “supply push” market. However, the graph highlights the “demand pull” market of 2009 during which worldwide demand – particularly in China – was strong and supply was diminished due to drought conditions in South America. During this period, the correlation between transportation costs and origin basis was not existent. This dynamic can be observed in all 36 locations analyzed for the study. To complement the empirical data collected for the study, O’Neil Commodity Consulting conducted a survey in which 11 grain traders were asked if freight rate increases are passed onto the end user or if most increases are passed onto the producer. Seven of the 11 traders responded that freight increases are passed back to the farmer. Two responded that such costs are passed onto the end user with the remaining two suggesting that the costs are split between the farmer and the end user. The entire study, along with the individual graphs and data from the 36 soybean loading facilities, can be accessed at www.soytransportation.org. The Soy Transportation Coalition is comprised of eight state soybean boards, the American Soybean Association, and the United Soybean Board. The National Grain and Feed Association and the National Oilseed Processors Association serve as ex-officio members of the organization.